3-11 –Bam Bam Where's Your Child? 4-3 –Neal Howard To Be Or Not To Be? 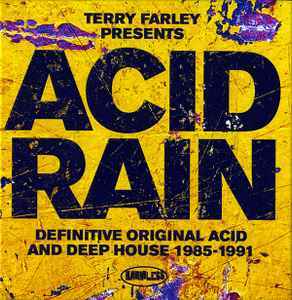 "Terry Farley Presents Acid Rain: Definitive Original Acid And Deep House 1985-1991"
61 Original Acid & Deep House Classics. Compiled By Terry Farley. Full Length 12" Versions. Remastered To The Highest Quality! Funny he put both Jack Frosts' 'Shout' and 'Cool & Dry' on here, as they're basically the same track. Had to comment on this one. I have over 30 vintage House and Acid compilations on vinyl, most bought at the time, and a good dozen CD compilations acquired over the intervening years. None is of consistent quality - an exception being the superb "Acid House" and "Mysterons" collections on Soul Jazz. Those older compilations always have a handful of shonky tracks on them, but they remain indispensible to me as each and every one has one or more unique track(s) above the quality bar. This collection takes it to the next level. Not only is the quality exemplary, bringing together 61 (!!) tracks combining well-known favourites with lesser known classics and possibly covering every one of those compilations I own, it STILL manages to throw in at least a dozen tracks that I have never heard before - and what tracks! In spite of Terry's difficulties in procuring his original shortlist (or maybe to some extent, because of them), there are some real unexpected gems dotted throughout the compilation. The same will be true for any Acid House aficionado, and the great thing is, the selection of tracks will be different for every individual. By that token, I shall not bore the reader by listing them, but simply exhort - "GO BUY"
For anyone who would like an introduction to those heady days. This is a must buy item.